What should you do when operating light don't work properly? Do you know the following tips for surgical light trouble shooting? Here are some practical and useful tips for operating light trouble shooting, to help hospital medical staff maintain and repair surgical light in operation theatre (OR), when your light don't work properly. (1) Main light isn't working, auxiliary light is on. 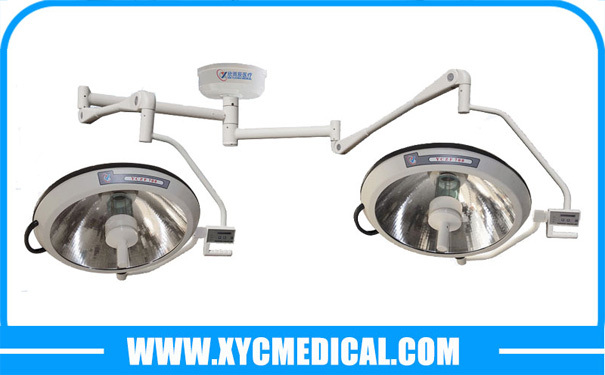 ZF (halogen) series surgical light's circuit controlling system has automatic switch function, when the main broke down, auxiliary light will turn on to ensure the operation smooth process, main light should be replaced immediately after the surgery. Open top cover, check the safety wire whether fused or not, whether supply voltage is normal, if both of them work well, please find professional staff to repair. In general, there are two reasons caused damage to the transformer, supply voltage problem and short circuit which caused large current, if it's the second reason, please find professional staff to repair. Check the bulb in use whether configured according to the specified rated power, the bulb which configured with large power will lead to fuse wire beyond its capacity of rated current and caused damage to the fuse wire, check supply voltage whether is normal or not. Disinfection handle of the surgical light can use high temperature to sterilize (details in operating instruction), notice that the handle should not be pressed by weight when disinfected, it may cause transformation. This was largely because of the sensor at both ends of surgical light's rotating arm, it may appear poor connection problem after a period of use, in this case, it's time to find professional staff to maintain and repair you light. After a period of use, due to the heavy weight of lamp head, surgical light need large friction to position, may generate movement, If this situation you can tighten the locating screw at the top of spring arm, to increase the friction. The reflector glass bowl of hole type surgical light adopt coating film technology. In general, coating film technology can only ensure two years’ service life, the coating will have problem after two years, such as reflector darkened, blistered and so on, therefore, in this case you'll need replace reflector glass bowl. Clients purchased emergency light, whether use or not, must ensure that storage batteries are fully charged every three months, otherwise battery will be damaged.